Home to several Yadav family bastions, Phase III of the Uttar Pradesh assembly elections is especially crucial for the Samajwadi Party. Rediff.com's Aslam Hunani lists all that you need to know before the polls on Sunday, February 19. The third phase of polling in the marathon Uttar Pradesh assembly elections will take place on February 19. While Phase I saw the battle for sensitive Western UP and Phase II was a test of minority outreach for the leading parties, Phase III is being seen as the Akhilesh Yadav-led Samajwadi Party's litmus test. 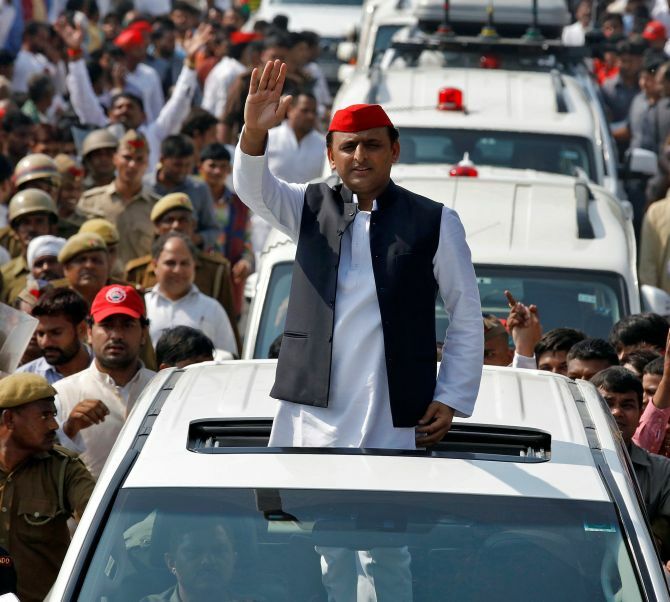 In the 2012 assembly elections, the SP scored a sweeping majority in the 12 districts that are part of this phase -- Farukhabad, Hardoi, Kannauj, Mainpuri, Etawah, Auraiya, Kanpur Dehat, Kanpur Nagar, Unnao, Lucknow, Barabanki and Sitapur. Three of these 12 districts -- Etawah, Kannauj and Mainpuri -- are considered Yadav family strongholds. Akhilesh was born in Etawah. Dimple Yadav, Akhilesh's wife, is the member of Parliament from Kannauj. And Tej Pratap Yadav, Akhilesh's cousin, is the MP from Mainpuri. The SP won all 12 seats in these three districts in 2012. Retaining the family strongholds is even more important for Akhilesh in the light of the Yadav family feud, which ended with his father Mulayam Singh Yadav being removed as party president, and the Akhilesh faction of the SP winning the right to use the party's electoral symbol, the cycle. This phase is also important for the Yadavs as it will see the family's younger daughter-in-law, Aparna Yadav, contesting elections for the first time. The party has fielded Aparna from the Lucknow Cantonment constituency, which the party has never won. She faces the Bharatiya Janata Party's Rita Bahuguna Joshi who left the Congress last year. This phase will also decide the fate of some well-known political personalities like Shivpal Yadav, Mulayam Singh Yadav's youngest brother who will seek relection from Jaswantnagar. Once a party heavyweight, Shivpal Yadav is a lonely figure now after he lost out in the power struggle with his nephew Akhilesh. He is banking on sympathy votes to retain the constituency. The touch-and-go seats in this phase include Farrukhabad (Farrukhabad), Balamau (Hardoi), Rudauli and Misrikh (Sitapur), Ghatampur and Bithoor (Kanpur Nagar), Bakshi Ka Talab (Lucknow). Nineteen of the 69 seats are reserved for scheduled caste candidates. Phase III also has the dubious distinction of seeing the BJP fielding even more candidates with criminal records than any other party! According to a report by the Association for Democratic Reforms, 21 (31%) of the BJP candidates in this phase have criminal records. As does the BSP. The SP has fielded 13 (22%) candidates with a criminal past, the Congress 5 (36%), and the Rashtriya Lok Dal 5 (13%). Of the Independents in the fray, 13 (6%) have criminal records. A massive 31% of the candidates, 250 of them, are crorepatis, with the richest being the SP's Anup Kumar Gupta, who is fighting the election from Maholi. He has self declared assets worth Rs 42 crores (Rs 420 million). On the lower side of the graph are the Communist Party of India's Mohammad Akram Khan (Lucknow West constituency) and the Awami Samta Party's Suresh Chandra (Laharpur constituency). They have declared zero assets in their self-sworn affidavits. On the education front, 418 or 51% candidates have declared an educational qualification of graduate or above, while 320 (39%) candidates have declared their educational qualification to be between the 5th and 12th standards. Despite being the phase with districts of the Yadav bahus, only 96 (12%) of the candidates in the fray here are women. The next phase of polling, once again across 12 districts, will take place on February 23. Scroll down for more exclusive poll stories from Uttar Pradesh.